Yamaha's 01X is a digital mixer, hardware controller, audio and MIDI interface that promises an unprecedented level of integration with computer-based DAWs. But can this one silver box really do it all? It is now around a year since Yamaha previewed the 01X, a combined digital mixer, audio/MIDI interface and hardware control surface intended to be used with any Mac or PC sequencer. It is designed to work on any computer with a Firewire connection, and will eventually run under Windows XP, Mac OS 9.2 and Mac OS X. Even though the 01X has arrived on the market a little later than expected, Mac OS X support is still not available, but we are expecting an announcement of forthcoming availability at the Winter NAMM show in January, which will already have taken place by the time you read this. It's unfortunate that the Mac OS X driver wasn't available at the time of this review, but this is such an important product that we decided to review it with Mac OS 9 now and to do a brief follow-up piece when the Mac OS X drivers become available. It's no secret that Yamaha's big crusade over the past few years has been to promote their mLAN system. Using an IEEE 1394 Firewire connection, mLAN is able to send multiple streams of audio, MIDI and sync information over a single Firewire cable, but mLAN is more than a simple repurposing of Firewire — it requires a dedicated mLAN chip set in the connected mLAN device. 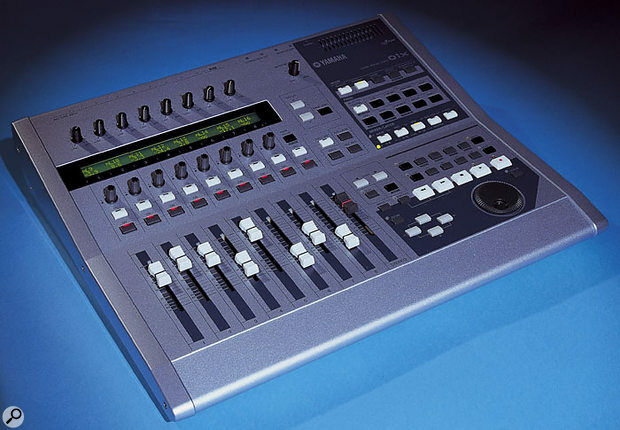 An obvious use of mLAN is to allow Yamaha's existing digital mixers (fitted with an mLAN card) to function as audio I/O devices for computer audio software, but in the 01X, all its talents are put to good use, as the unit provides everything needed to complete a digital studio other than the computer/software package, the monitor speakers and the microphones. Furthermore, the 01X can be added to using other mLAN devices — for example, you could plug in a Presonus Fire Station to add more mic inputs. On the PC platform, the 01X currently works with Windows XP (Professional or Home Edition) and requires a computer capable of running the host software, with an IEEE 1394 Firewire port. Mac users can run the 01X under Mac OS 9.2, though Classic Mode is not supported. OS X support is in development. Again, a Firewire port must be available, and in the case of laptops, Processor Cycling should be disabled. The 01X combines a computer audio interface, a fully automated, moving-fader digital mixer, two MIDI interface ports and a DAW hardware control surface. It connects to the host Mac or PC computer via a Firewire cable and utilises Yamaha's latest-generation mLAN chip set to provide low-latency audio interfacing, though it can also be used in a stand-alone mode for live sound mixing if required. It can work at up to 24-bit, 96kHz, has the same kind of built-in effects and signal processors as Yamaha's stand-alone mixing desks, and can handle a maximum of 28 audio channels. It comes with a set of software tools, including a dedicated Studio Manager application, plus a suite of host-powered plug-ins that will work in most of the popular audio sequencing packages. All the necessary installation and driver software is included on CD-ROM, including a copy of OMS 2.8.3, which Mac OS 9 users will need in order to get the MIDI side of the 01X up and running. 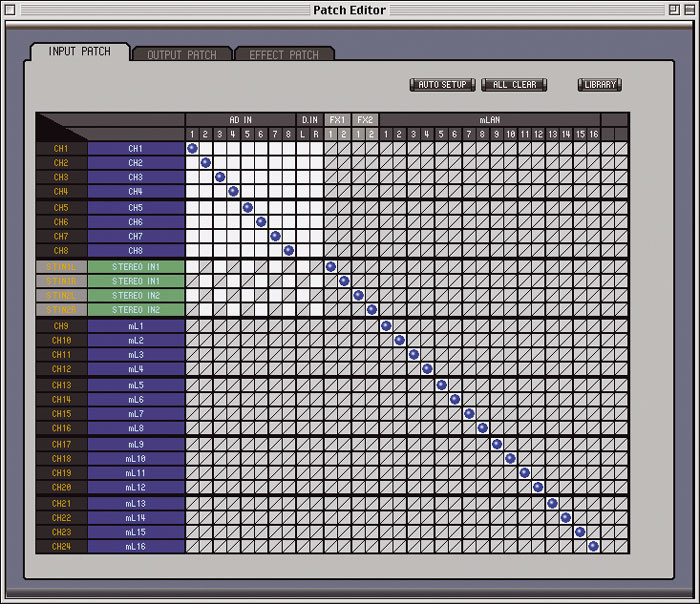 The Studio Manager software allows you to adjust and store every 01X parameter from the connected Mac or PC, including (from top) input and output routings, the mixer settings, and parameters for the multi-effects processors. Physically, the 01X has eight analogue mic/line inputs, two of which are on XLRs with switchable phantom power, with the remaining six on balanced jacks. 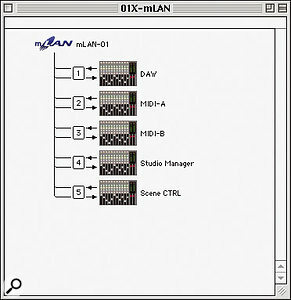 A further 16 inputs can be accommodated via mLAN and these will normally be fed from the mixer section of a computer DAW application, though the 01X can also be connected to other mLAN devices. A pair of S/PDIF in and out connectors is also fitted as standard. Two further master mLAN return channels are available, so it is possible to mix a maximum of 28 inputs. Though the faders are 60mm rather than 100mm, they are smooth and fully motorised, and there's a generous display running the full width of the input channel section. As a remote controller for a software DAW, the 01X comes ready-configured to work with Cubase SX/SL, Nuendo, Sonar, Logic, Digital Performer and many popular soft synths via its dedicated 'remote mixing layer'. You just dial up the sequencer you're using on the 01X and the job is done. 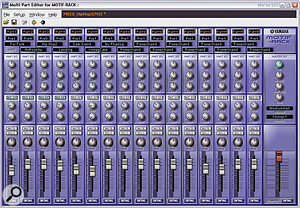 In addition to the obvious fader levels, pan positions, transport control and record-ready arming, the unit can also access the scrubbing functions of the host software, re-scale the screen zoom resolution and even access plug-in parameters, so it comes very close to the functionality of a dedicated unit such as Mackie Control or Houston. The two physical sets of MIDI ports are augmented by additional 'virtual' Firewire-based MIDI ports for controlling the DAW software and also for communication with the Yamaha Studio Manager software, so you don't lose either of the physical ports when using the 01X as a control surface. When it comes to processing, the 01X is structured much like Yamaha's dedicated digital mixers, insomuch as it has independent dynamics and four-band parametric EQ on every channel plus two high-quality multi-effects blocks, which means you're no longer restricted to using underpowered native reverb plug-ins. In fact the 'mixing engine' is based around the same chips as developed for use in Yamaha's current range of 96kHz mixers (including the 02R96), and it is this chip set that provides the two 32-bit DSP effects engines, each capable of producing various types of effects, including reverb. As is the case in most digital mixers, if you use the 01X at high sampling rates, the effects capability is halved. In addition to the 01X and its support software, the package includes three host-powered plug-ins in VST/AU format that can be used within your host DAW software. These comprise Vocal Rack, a set of vocal polishing tools including compression and EQ, Pitch Fix, which does much the same job as Auto-Tune, and Final Master, a multi-band mastering compressor with limiter and soft clipping. These are also available to purchase separately, and as such they were reviewed in SOS February 2004. Windows users also get Yamaha's SQ01 v2 MIDI + Audio sequencer software, the TWE wave editor for modifying audio recordings and a Multi Part Editor for the Motif Rack synth module. Measuring 453 x 391 x 116mm and weighing 6.2kg, the 01X has the same solid and well-engineered feel as Yamaha's other digital mixers, featuring all-metal construction, large buttons with a positive action, chunky transport controls and a large rotary encoder for data entry and scrubbing. It has an external, in-line power adaptor that connects to the rear of the unit. All the connections are on the rear panel. The mic/line inputs are based on Yamaha's new preamp circuitry and have gain trims at the head of the channel strips, while input eight has an extra high-impedance jack for direct connection of electric guitars and basses. The rear-panel phantom power switch applies to the two dedicated XLR mic inputs only, though all eight inputs can be used with microphones. The S/PDIF input has sample-rate conversion, which can be bypassed when it's not needed, and there are four analogue outs, two used as control-room monitor outs and affected by the master level control, plus two additional outputs that may be configured either as the main stereo outs or as aux outs. The S/PDIF out could be used for feeding a stereo mix to a separate recorder, but today's studio user is more likely to mix back to the computer, an option the 01X also caters for. The two sets of MIDI In and Out ports are also on the rear panel along with two Firewire ports, a headphone output jack and two footswitch jacks. These jacks can be set to control the transport and punch-in functions of the host software. A Standby/On switch powers up the unit. Turning to the front panel, this is set out very clearly, with the left-hand side of the surface occupied by channel controls comprising a fader, two knobs and two buttons per channel. The uppermost knob is the input gain trim, while the other is an assignable controller that works in conjunction with the display running above it. This dial includes a push switch used to confirm or toggle the parameters shown in the display above. That leaves the Channel Select button, which determines which channel is currently being adjusted, and the Channel On button, which can actually have several different functions, including Solo and Record Ready, depending on the settings in the master section. As there are only eight channel faders plus one stereo master fader, the mixer is arranged using the familiar layer system so, depending on what layer you're in, the faders control the input channel levels, the aux/rec buss levels or the remote software control levels. OPT (Open Plug-in Technology) was announced by Yamaha at the Frankfurt Musikmesse in 2002 and was touted as a means of controlling external hardware from within the plug-in environment of the host sequencer of choice. As with all such standards, this relied for its success on the support of mainstream audio software manufacturers. Cakewalk and Sonic Foundry were early adopters of the protocol, which clearly pleased Yamaha, but the Apple Mac side took longer to get going, which meant companies such as Emagic and Steinberg were reluctant to get involved. Fortunately, with Mac OS X, it's a different story, as Yamaha's computer audio specialist Nick Howes explains. "Now with OS X and its COM-like interface structures (COM is the Microsoft Component Object Model system, which OPT uses), Yamaha have been able to port OPT over to the Mac platform, and expect to have cross-platform OPT implementations of many products, such as Studio Manager, released this year. The integration this will provide a previously unheard-of level of hardware control from within a software sequencing environment for products like 01X, and other mLAN-based devices such as the Motif ES/mLAN16E. OPT will give us the total recall scenario with 01X that everyone wants for both the internal mixer and the remote layers, and will obviously benefit products like the 01V96 as well. "Additionally, we have a Windows XP (and soon Macintosh) network driver due to debut at NAMM, and using this, the 01X will be able to send and return aux effects over mLAN to mLAN hardware devices, such as the Kurzweil KSP8. All four auxes can be routed in this way (the internal effects can be bypassed)." The master section is to the right, and other than the headphone level knob and the data wheel, is comprised entirely of buttons. Directly below the headphone control is a section containing the Display Up/Down cursors and the Page Shift button. These are used for navigating the display pages. Below are four more buttons. One is for Auto Edit which, when active, allows manual activation of the 'Touch In' mode using the Channel Select buttons. With Touch In active, the system registers as soon as a fader is moved, and there's also a Touch Out function that times out after a fader has stopped moving. The idea is that the system knows when you are making control changes, even though the hardware doesn't use conductive fader caps. Auto R/W enables the mix automation to be switched using the Channel Select buttons, while Solo switches the function of the Channel On buttons to Solo buttons. Rec Rdy sets the function of the Channel On buttons so that they act as Record Ready switches. 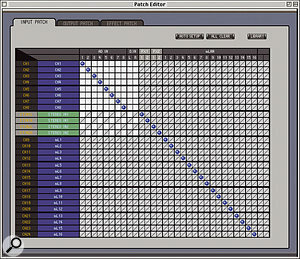 Bank buttons are used to move between sets of eight channels in the host software, while Flip swaps the functions of the channel knobs and faders in the conventional way. Bank seems to work by grouping the host software tracks into functional categories such as Audio, MIDI or Instrument, so if you have more than eight virtual instruments, the Bank switch would be used to access these in blocks of eight. The display always tells you what you are looking at, so there's little chance of getting lost. A Shift button accesses alternate control functions (including access to plug-in effects and instruments), much as it would on a computer keyboard, and the transport buttons work like those on a tape recorder or hard disk recorder. Directly above the transport keys are function buttons 1 to 8 (which in Logic are set to access screen sets), Edit and Loop buttons (with LED indicators) plus Save and Undo buttons. The Save and Undo buttons also have status lamps that let you know when there is anything available to be saved or undone. Within easy reach of the data wheel are four cursor buttons plus Zoom and Scrub functions: Zoom switches the function of the cursor keys while Scrub allows the Data wheel to be used for scrubbing if the host software supports that feature. The remaining buttons are organised into further subsections and are located in the grey shaded area at the top right-hand corner of the front panel. Row one is dedicated to Mode controls. The Remote button tells the 01X to act as a controller for your DAW, with mixer layers directly selected using the dedicated buttons at the bottom of this section. In this mode, the functions are marked above the Mixer/Layer buttons. In Internal mode, by contrast, the Mixer/Layer buttons work according to the names printed beneath the buttons. A Monitor A/B provides a means to adjust the level of the stereo out from the 01X mixer and the output from the DAW software's mixer — pressing the switch toggles between the two functions. Scene is a familiar concept to Yamaha mixer users and is used for storing and recalling mix scenes, which consist of a snapshot of all the fader levels, send levels, aux levels, channel On settings, channel Phase and Attenuation settings, dynamics, EQ, pan, Buss Outs, fader and mute Groups, Channel Pair status, effect type and settings, and input and output patch routings. 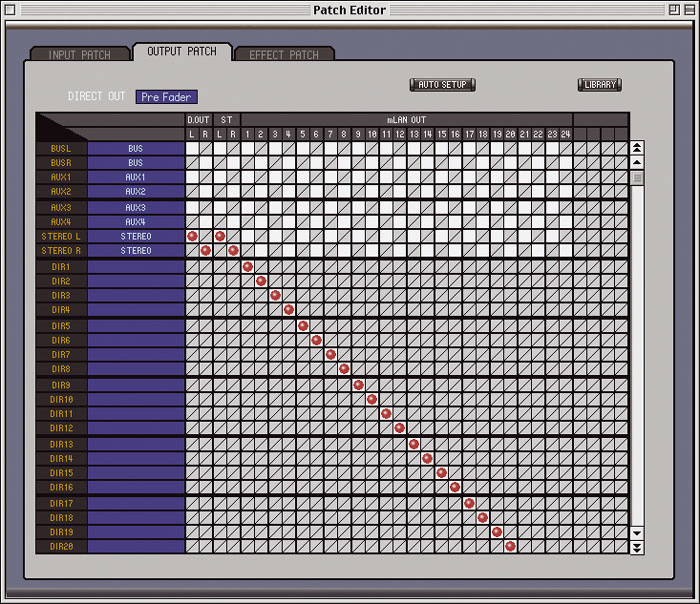 Input and output patches must be stored in the patch library before they can be used within Scenes. Moving down a row brings us to the Selected Channel button, which toggles between Selected Channel display mode and Multi Channel mode. In Selected Channel mode, the display shows multiple parameters for a single channel, whereas in Multi Channel mode, it shows a single parameter across eight channels. Sharing the same row are the four EQ buttons for accessing the Low, Low Mid, High Mid and High EQ sections, while the row below is given over to the Pan, Send, Dynamics, Group and Effect select buttons. It's all very familiar if you've used a Yamaha mixer even casually. Yamaha's Studio Manager can be run as a stand-alone application or as a plug-in within any environment that supports the OPT (Open Plug-in Technology) format described in the earlier box. Studio Manager allows routing and other mixer functions to be set up on screen, and also acts as an external library for any saveable settings. 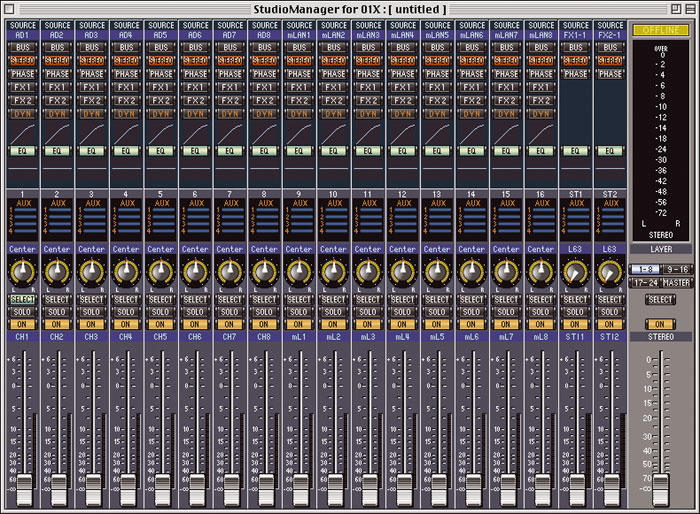 Using Studio Manager, it is also possible to copy settings from an 01X channel to its plug-in counterpart and vice versa. Studio Manager is particularly useful for setting up new patching assignments, as the 01X's long, narrow display isn't well suited to displaying the type of routing matrix we've come to expect in other Yamaha mixers. Effects may also be edited using Studio Manager. Communication with the host software is bi-directional, which means that when the remote control layer is active, changing a setting on screen will update the 01X and changing an 01X control will update the screen settings. Track names in the host sequencer automatically show up in the 01X. When it's used as a mixer, the Mixer layer buttons enable the user to instantly switch between layers comprising three banks of eight channels or the master controls, whereas in DAW control mode, the same buttons can be used to move through banks of Audio tracks, MIDI tracks, Instrument tracks, Busses and Auxes, while a further Other button accesses additional features. There are no dedicated meters, but the display is able to show both horizontal and vertical metering options. Using the Studio Manager software, the mixer setup can be automatically saved to your computer whenever you save a song, but the 01X data is stored in Studio Manager rather than in the song file itself, which is not the case with dedicated units such as Logic Control. The 01X Channel plug-in enables additional 01X virtual channels to be used within the host sequencer, and channel data can be copied in either direction using Studio Manager. The 01X features dynamics processing on every channel other than the stereo input, with a choice of compressor, expander, compander or ducker/gate. A dynamics library comes with the usual bewildering raft of presets, but editing is very straightforward, with full control over Threshold, Ratio, Attack, Release, Gain and Knee (in compressor mode). Parameter views can either show multiple parameters for the selected channel or a single parameter for all channels. 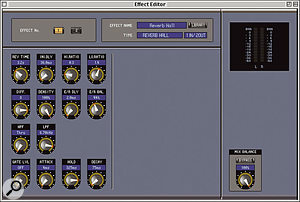 The effects sends are set up so that auxes 1 and 2 feed external effects, while sends 3 and 4 are, by default, reserved for feeding the internal effects, though all the sends can alternatively be routed externally via mLAN to be used as digital aux sends, as described in the box on OPT. 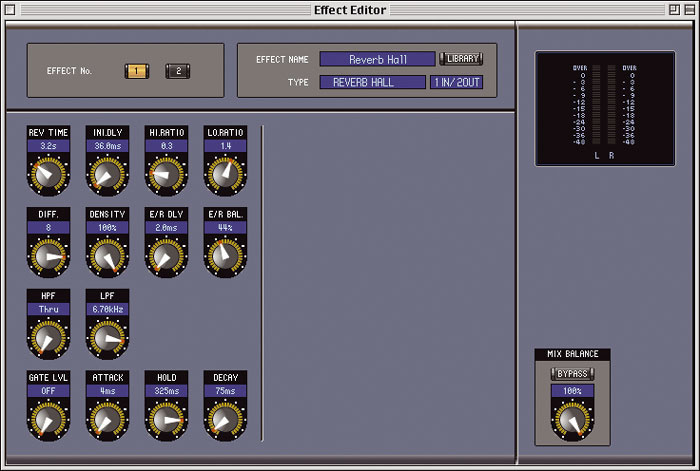 Again, there's a whole library of effects to choose from, with a sensible number of editable parameters per effect. Both blocks have a similar repertoire of effects starting with numerous high-quality reverb algorithms, which cover all the usual room, hall plate, early reflection and non-linear varieties. There's also a good selection of mono and stereo delays and echoes, all the standard chorus/flange/phase/panner/tremolo modulation effects, plus Yamaha's own classic Symphonic Chorus. These are augmented by pitch-shifting, rotary-speaker emulation, ring modulation, filters and distortion/amp simulation. These single effects are also accompanied by a useful selection of dual effects which are mainly delay or reverb in combination with one other effect. The repertoire also includes multi-band dynamics, stereo reverb and a comprehensive stereo, three-band multi-filter. As far as I can tell, these effects are identical in structure and quality to the ones used in the 01V96 mixer and other recent Yamaha digital desks. Subjectively, all these effects are clean and clear, aside from those distortion effects that are clearly not meant to be, the pitch-shifting is as good as can be expected and the reverbs stand up very well alongside mid-price hardware units. Installing the 01X in Mac OS 9 creates five new OMS objects, including the 01X's two hardware MIDI ports.I tested the 01X on my Mac G4 running OS 9.2, which meant using OMS to handle the MIDI configuration. It turned out that I need not have killed the chickens, boiled the garlic or prepared the crushed skulls, as this part of the installation turned out to be very simple and it worked first time (or maybe that was because of the garlic, chickens and so on!). When I plugged in the Firewire cable and booted up Logic, my sequencer of choice for testing, the 01X showed up as a new Logic Control and the two MIDI ports were available in the Environment for the connection of a master keyboard and slave modules. All the internal MIDI communication between the 01X and the host software is handled transparently so the user doesn't need to get involved. There are a few settings to make in the 01X, which must then be saved in the Utilities menu, but the installation guide walks you through this a step at a time and the whole installation takes only a few minutes. In fact I think the manual and support documentation warrants an honourable mention, as it takes you through the functions and operation of the unit in logical steps and also provides full tables of control functions, including those relating to the control of specific sequencers. Once set up, I called up a software instrument in Logic, routed it to mLAN outputs 1 and 2 — and then scratched my head because I couldn't hear anything! A few seconds later the answer arrived in one of those 'doh!' moments — I'd been treating the 01X as a replacement for Logic Control, which to a large extent it is, but it is also a conventional digital mixer through which the outputs from the Logic mixer must pass. I had the instrument turned up in Logic and the 01X display meter showed signal was being received, but I hadn't turned up the faders in the audio layer — which was controlling the hardware 01X mixer through which my instrument was being fed. A quick visit to the mixer layer and that was soon remedied. Once I had set up suitable default channel settings for a typical song, I saved them as a Scene so I could get it back by recalling the Scene at any time. Other routing or mixing options can also be saved as Scenes, but you have to remember to save routing setups to the routing libraries before saving the Scene, or they won't come back as you might wish! As with other Yamaha mixers, channels can be paired for stereo use, which links the faders, aux send levels, the EQ and any channel processing applied. Hitting the Sends button allowed me to adjust the send level being fed to the internal processors, and within seconds I had a nice concert hall reverb on the boil. It's surprising just how much you can control from this little box — I checked out the data wheel for moving the song position line and for scrubbing within Logic, which worked fine, and the cursor buttons for moving through the tracks or for zooming. No problem. The eight function buttons ran through the screen sets I'd set up in my Logic default song and a little key-prodding allowed me to step through the automation status of any selected Logic track. Other commonly used features such as markers and loop points are also accessible, but the 01X goes much further into Logic Control territory by allowing you to insert instrument or effect plug-ins and to adjust their parameters via the eight rotary encoders. Again all names and parameters are shown in the display, very much as they are in Logic Control. If I were to make one suggestion, it would be for Yamaha to include an expander mode emulation, so that existing owners of Logic Control or Mackie Control can use an 01X as an eight-fader expansion box as well as a mixer and audio interface. For mixing down into Logic, the routing functions allow the stereo mix out to be fed back along the Firewire/mLAN cable into a stereo Logic channel, but you don't need to get into routing right away as the default is set up correctly for piping a Logic mix through the 01X and on to the stereo outs. A fast guide sheet is also provided to show how to set up other common routing requirements. You can also determine at the setup stage how many ins and outs you want to use with the 01X, so if you only plan on sending a stereo output from your computer's mixer, you don't have to look at lists of unused channels. In most cases, it's enough to send eight mLAN channels from your sequencer, as most mixes can be submixed into eight streams, and if you're using external synths, you can feed them into the mix via the eight analogue inputs of the 01X. In theory, instruments with mLAN outputs can be fed in to the mixer without the need for any expansion hardware up to the maximum channel capacity of the 01X, but I didn't have any mLAN instruments available to try. I think the sound of Yamaha's EQ has improved somewhat since their early digital consoles, and having four fully parametric bands (where the high and low bands can also be set to shelving) is about as much power as anyone needs in that direction. The dynamics section also features a nice compressor that controls levels well without trashing the sound, but I couldn't find a gain-reduction meter, either on the unit or mentioned in the manual. I feel that leaving a gain-reduction meter off a compressor designed to be used by relative newcomers to audio processing is quite unforgivable, as it's the only guide you have that the amount of compression is in the right area. Gain-reduction metering is actually available in the Studio Manager software, but Yamaha have already taken note of my comments and have passed on the information to their design to team to see if it is possible to add gain-reduction metering during a subsequent 01X firmware update. This would be most welcome as with compressors as transparent as these, even the more experienced user might find it hard to fine-tune a setting purely by ear. What's more, although there are libraries full of preset compression settings that can be adjusted and re-saved as user settings, without a gain-reduction meter it's very hard to adjust the threshold of these presets to suit the signal being treated. These are minor quibbles, though, when weighed against what Yamaha have got right for the price, and the onboard effects processors are certainly worthy of praise. The 01X combines the best elements of all the different add-ons you need to turn a computer-based digital audio workstation into a recording studio. Admittedly, it doesn't have a two-track recorder connection, and nor does it offer surround monitoring or any talkback facilities, but it does provide a superb multi-channel Firewire audio interface that sounds as good as the latest generation of stand-alone audio interfaces, two free MIDI ports, a full-spec Yamaha digital mixer with moving faders, snapshot automation and onboard effects and dynamics, with a serious control surface. 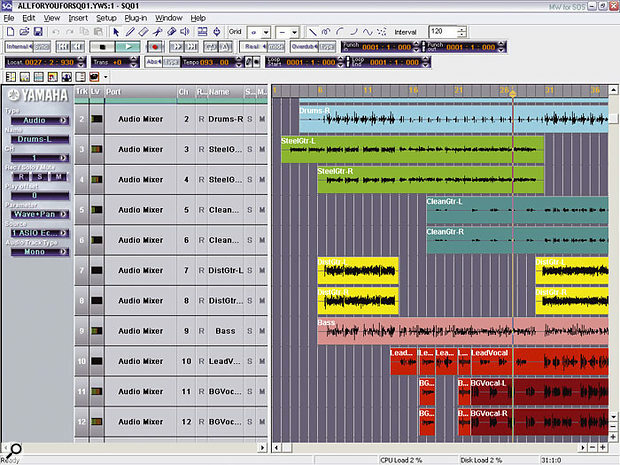 It also comes with some seriously worthwhile plug-ins, Studio Manager software and even a Windows sequencer for those not already aligned to one of the existing major DAWs. Because connection is via a single Firewire cable, the 01X should be particularly attractive to anyone using laptops or slotless iMacs, but that doesn't preclude it from use with desktop machines as it offers a huge amount of well-thought-out, high-quality functionality at a bargain price. Anyone making music on a computer who hasn't yet bought a sophisticated audio interface or control surface should take a close look at this product. Although some Firewire devices will run with Windows 2000 with Service Pack 3, the 01X will only run with Windows XP — a wise decision in my view, since XP has proved to be the most stable Microsoft OS for musicians. Also sensible is the recommendation of a 2.2GHz or faster processor, partly due to the current high overhead of the PC mLAN drivers (more on this later). As always, I took the precaution of visiting the appropriate web site before installing any drivers — a wise move in this case since Yamaha had just posted a new version 1.3 of the mLAN driver and Tools for both Mac and PC in early January, which among other improvements supports Sleep, Hibernation, and Resume modes (these seem notoriously tricky for all Firewire devices to cope with), along with a new version of the Pitch Fix plug-in that cures a problem with excessive CPU load in Cubase SX 2.0. After installation, PC users can select the best Mode for their audio software in the mLAN Driver Setup dialogue. There are three choices: ASIO is the best choice for Steinberg customers, while WDM is obviously more suited to Sonar users, and WDM(2CH)+ASIO is a special setting for certain sequencers such as Yamaha's own Windows-only SQ01, bundled with the 01X. Yamaha's SQ01 v2 MIDI + Audio sequencer is included for PC users. In fact, as Paul mentions in the main text, Windows users get quite a bit more software than Mac ones. SQ01 version 2 is a comprehensive MIDI + Audio sequencer with overall track view, piano-roll and list editors for its MIDI parts, master track, MIDI and audio mixers. It supports VST plug-ins and Instruments, and there's a MIDI mixer; an associated Audio Mixer application can also be installed separately after SQ01, as can the stand-alone Tiny Wave Editor — a handy little audio editor if you don't already have a more capable one. 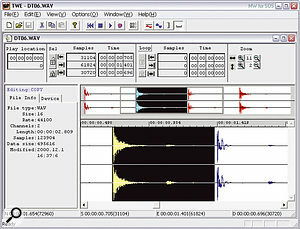 SQ01 also acts as a host application for OPT software, such as the 01X Studio Manager. 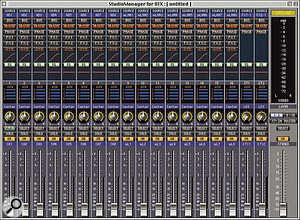 The 01X comes with an impressive bundle of Windows software including this Tiny Wave Editor stereo editor.It didn't take me long to get up and running with the ASIO drivers and Cubase SX 2.0.1, and I experienced no problems even using the lowest 2ms buffer size and very low latency setting at 44.1kHz, giving me a reported input latency of 3ms and output latency of 4ms. The remote control functions also worked well (Yamaha use Cubase SX examples extensively in the 01X Owner's Manual), while the final ever Logic Audio release 5.5.1 on the PC is also reported to work fine with the 01X with the ASIO drivers. Sonar users should currently stick with WDM drivers, as even with the latest Sonar version 3.01 patch, using ASIO drivers with the 01X resulted in sound breakup like gross distortion, as I also found they did in Wavelab 4.01. Yamaha are aware of this, and a driver release slated for February is expected to resolve the problem. Once I'd switched to WDM from the 01X Driver Setup window I managed Sonar 's lowest 2.2ms effective latency at 44.1kHz with no glitching, and Wavelab also worked fine, although once you click on the Set button after selecting a new driver Mode I found it could take anything up to a minute to perform the changeover and reinitialise the 01X. Within Sonar, you can use the View OP Panel function to launch the Motif Rack Editor, but unfortunately not Studio Manager (it gives a "Que in raw" error message). This is because Sonar only supports OPT Level 1 panels, so you have to launch the stand-alone version of Studio Manager, just as you do with most other applications other than Yamaha's own SQ01. 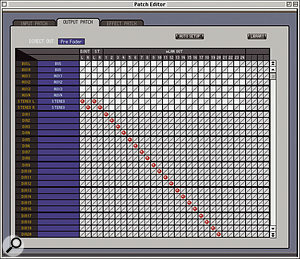 Multi Part Editor for the Motif Rack synth module.I got on well with the 01X's internal effects, and they can take a considerable load off your main processor. In particular, the reverbs sounded rich and smooth, and the four-band EQs fairly musical compared to some. The EQs are hard-wired before the dynamics section in the channel signal path, and although some people may miss the flexibility of being able to swap them over, Yamaha could possibly make this an option is a future firmware release. However, having the EQ first is the traditional approach with most multi-stage mastering plug-ins, and will work well in most situations. Unfortunately, the CPU overhead of the PC mLAN driver is still currently rather higher than users (or Yamaha) would like. Even on my own 2.8GHz Pentium 4, with the default settings I experienced a cyclic CPU peak that rose to about 20 percent every couple of seconds, even before launching any audio application. It's important to realise that this isn't a fundamental problem with the 01X, since it doesn't happen with the Mac's OS 9.2 drivers. Some PC users have apparently also experienced additional CPU spikes, which Yamaha think may be DMA-related, and at the time of writing their engineers are working flat out to eradicate both problems — hopefully they will be history by the time you read this. 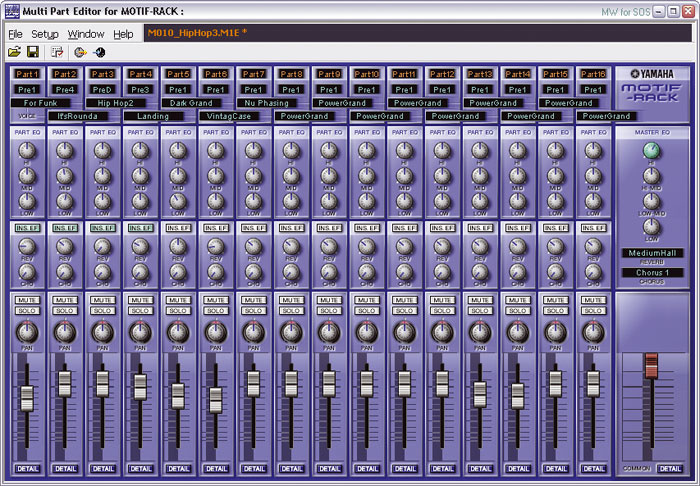 All the sections behave seriously well, from the control surface emulation to the digital mixer. 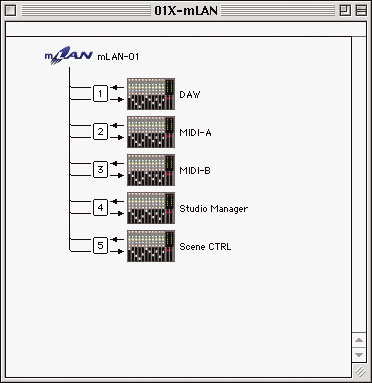 I/O can be expanded via mLAN. Connects via a single Firewire cable. Some metering and ergonomic aspects have been compromised due to the need to simplify the control surface. OS X driver not available at the time of this review. The 01X is truly a one-box solution to the problem of turning a computer and sequencing software into a complete and quite sophisticated studio system.